PrecipAlert allows you to configure alerts for both hourly and daily time frames as well as setting the desired threshold to be reached before sending an alert. Alerts can be set for both accumulated rainfall as well as forecast rainfall for your selected location. Alerts are easily activated and deactivated by simply checking the box of the desired alert. Alerts can be sent to multiple recipients either via email or text messages. It’s that easy! Register for a PrecipAlert Trial! Register today for your free, no obiligation 30-day trial (limited time only). 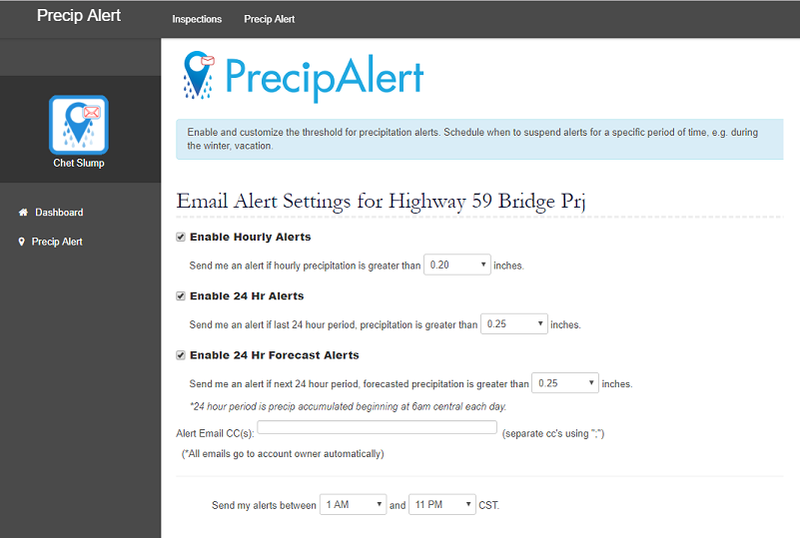 Set up five of your own pinpointed locations to track rainfall and receive rain forecast alerts. You will see first hand how PrecipAlert can save you time and assist you in managing resources, evaluating job sites and documenting rain events that slow your project or cause you to file reports for stormwater runoff. Click here to start your free 30-day PrecipAlert Trial today!